The weather this weekend was better than it was prophesied to be, so Gryphon and I took the opportunity to go out Knitting Around. And we found a lot of it. I’ve got enough bloggable material to entertain you with all week. For today, we’ll focus on the Halloween elements. That’s what’s timely, after all. Our first goal on Saturday was to capture a taste of Halloween. We began our quest at Lull Farm on Route 13 South, Milford, NH. Oh, Good! We Were Looking to See Pumpkins! This was a good place to start. Lull Farm grows a variety of unusual pumpkin types, in addition to the standard orange ones you can carve and cook with. There was little or no ceremony to the presentation of the goods – just massive heaps of the gourds everywhere. Lull Farm was getting ready for their annual Jack o’Lantern display. Last year, they lit 608 carved pumpkins on Halloween. This year, they hope to beat that record. A Growing Collection of Jack O’Lanterns – Will They Beat Last Year? They were well on their way towards that goal on Saturday. A patch at the back of the nursery lot was set aside for the finished pieces, and they had already accumulated a large number. To give a sense of perspective – that’s Gryphon all the way at the back of the photo, and he’s over 6 feet tall. This Guy Looks a Little Scared – Afraid of Crowds, Maybe? A tent was set up, and anyone who came by could carve a pumpkin or two to contribute to the display, if they liked. We passed on the opportunity – we had other places to go! Our next stop was Brookdale Fruit Farm, located on Route 130 in Hollis, NH. Brookdale is one of the large growers of produce in NH, and they have an amazing gift shop and a nice greenhouse full of plants as well. My memory was that they’d have something impressive out front for the season that I could Knit Around with – and I was right! He looks like he’s already getting a bit tired of the season. Or maybe he’s just trying to see what I’m knitting. (Which happens to be the Market Squares entre-lac bag, my current main WIP.) If you pop over to the Brookdale website, you’ll see what he looks like in his prime. As we were taking the Knitting Around picture, Gryphon spotted another pumpkin across the street – a Cinderella Pumpkin Coach was sitting by the road with a “For Sale” sign on it! Hmm…wonder what the MPG is? I showed you pictures Friday from the local kindergarten’s Halloween Parade. Today, the entire Florence Rideout Elementary School marched in a loop down from the school, around Main St., and back again. Being small town New England, this is an event that everyone comes out to see. It always happens around 1 p.m., and a little before that you can see locals lining the streets. The parade passes Town Hall on both sides, and all the staff comes out to watch it on the first pass at the back – then they go down the steps by the side of the building to catch it again on Main St. The various parades here in town always include at least one fire engine from the local department. For the Halloween Parade, the kids get to follow it along the route, with the sirens blasting to let the town know they’re coming. I took many, many more pictures than I’m going to inflict upon you here. Every child was adorable, and almost all of the costumes showed creativity, whether from the skill of the Mom or Dad who put together the outfit of their child’s dreams, or just the quality of costumes available to purchase these days. No one should feel slighted for not being included in this post. I had to be selective, so I chose my absolute, very favorite costumes to display. Witchy-Poo! Where’s Puf’n’Stuff When You Need Him? I’m not sure exactly what she’s meant to be, though I’m leaning strongly towards an anime character. I just loved the colors, and the go-go styling. Edited 04-25-06 to add: I have since been advised by a couple of readers that this little girl is portraying Daphne of Scooby Doo fame. Back in the 70’s, when Scooby Doo originally aired, I was a pre-teen and a big fan. But I haven’t seen the live-action Scooby movie, nor any of the newer animated versions, so the characters’ appearances are far from fresh in my mind. Besides, I remember Daphne wearing a dress with long sleeves, and simple little shoes – not go-go boots. I suppose the hair should have been a give-away, though! Very nicely done, and with a lovely Gryffindor scarf, too. I was impressed with the mummy costume. I think there’s a small gap in the cloth that the child is looking through, but I couldn’t swear to it. I see ninjas, soldiers, cheerleaders, monsters, and much, much more. A couple of Hogwarts students over on the right. And the chef made me laugh! At the end of the Halloween Parade, you’ll always find this teacher, Rhonda C. Watts. Rhonda also happens to be a certified riding instructor, with a specialty in Side-Saddle, among other techniques. This year, she appeared to be dressed as a Civil War camp follower. I love the moment of horse and rider that I happened to catch here. WIP reports – gotta have some fiber content! Whew – that ought to fill a few posts! Who knows, some of this might even spill over into next week! One of my favorite beaders has started her own blog! Judith Bertoglio-Giffin, known for her amazing beadwork and for her books on Bead Crochet Ropes, has entered the blogiverse in good style. Her first entry (after the obligatory “here I am!” post) is all about a freeform peyote bracelet she made with beads purchased on a trip to Shreveport and New Orleans, LA – mere weeks before Katrina. The finished piece, called “Memories of a New Orleans Swamp”, is a marvel in green, brown, and amber. Judith has been an amazing friend and mentor ever since she first walked into my fledgling bead store over three years ago. She is a Craft Goddess in every sense of the term. Do stop by her blog and welcome her into blogdom, okay? Scratch the whole previous post. Not the one that’s there now. The one that I deleted. In the unlikely event you read it before it went away, ignore it. Plans change on a dime sometimes, and that’s what’s happened here. I really wish I could just decide on something and have it stick, but I don’t get to do that this time. Don’t look for me at Panera tomorrow night – as much as I’d like to be there, I won’t. Thanks to Pamela for her supportive comment to yesterday’s post. I must have felt your spirit with me, because the evening at Santos-Dumont was less than satisfactory, but I nevertheless had the strength to stay there knitting and listening to the music for an hour and a half while I sipped my Republic of Tea Ginseng-Peppermint Tea. The ambience wasn’t what I hoped for. When you go to a coffee shop to hang out, you expect a certain amount of buzz in the air from people having conversations, but in spite of that you also expect to be able to enjoy quiet relaxation. But Thursday night at Santos-Dumont proved to be pretty slow, and within a half hour of arrival I was the only customer left. The three teenagers on duty used the slack time to do some clean up around the cafe, and rightly so – I expect staff to use slow times to take care of routine chores like that. The problem was, though, that they did it in a very loud and abrasive way. The girl who went around to empty trash cans took each lid and dropped it on the floor with a resounding bang. Each new garbage bag was loudly snapped in the air several times to open it. At least one trash can evoked loud “Ewwws! !” from her as its aromas were revealed, and then of course the other two had to come over and smell for themselves. So I was subjected to their loud exclamations of disgust. One of the boys took on the job of taking the bags out to the dumpster, and he dashed out into the cold with no jacket, ran to the dumpster, and came back in making triumphant exclamations to no one in particular over his feat. Cleaning supplies were removed from cupboards, and every door had to be slammed shut, not merely closed. Silverware was thrown into a bin, not placed. Chairs were re-arranged around tables by scraping them across the antique hardwood floor, not a one being lifted and quietly replaced. In short, nothing was done with any gentleness to it. Nothing was placed quietly where it belonged, it was always aimed from some distance and tossed or slammed. Every single thing they did could have been handled in a quieter way without hindering the process or their efficiency. Through the whole thing, the three teenagers chatted loudly with each other. I’m not saying they shouldn’t be allowed to talk, but they had clearly forgotten the childhood concept of using their indoor voices. This was all compounded by the fact that the building housing Santos-Dumont is an original one-room schoolhouse. Old construction, a very high ceiling, and every noise echoes-echoes-echoes throughout the space. This is the sort of place where you can whisper at one end of the room and be clearly heard at the other. Am I glad I went? Yes, even though at least half of the time I was there consisted of the noisy experience I just described. It broke a barrier for me where I was uncomfortable going alone to such a place to just sit by myself and knit for a while. Will I go to Santos-Dumont again? Maybe. I’ll concede I may have been there on an off night, and we already know that I was off balance myself. Maybe there’s another week night that sees more traffic and therefore is more likely to stave off the noisy cleaning burst. If I have occasion to have a gentle chat with the owner, I may bring up the subject, too, but I don’t feel it’s necessary to go out of my way for that. Will I go out to someplace else? Certainly. Santos-Dumont has the convenience of only being a little over a mile away. If I don’t mind going further, we’ve got a Panera in the same plaza as the local Target store. I’ll hazard a guess that they don’t see nights as slow as Santos-Dumont did last night, and I’ll bet they don’t get as noisy as that, either. I’ll probably try Panera next week. Dinosaurs and Pirates and Buzz Lightyear! One of the charming things I’ve discovered about small town New England is this: the elementary schools are nearly always close enough to downtown that the kids, at Halloween, get led down Main Street in their costumes in a parade for all to see. Here in Wilton, we get two separate parades: the kindergarten children in the morning, and the entire elementary school later. Halloween isn’t until Monday, so we were a bit surprised to see the kindergarten children parading this morning! They caught us a little off-guard, but Gryphon was together enough to grab the camera and dash across the street to take some pictures. As always, please click through to see more detail. Even the adults get into the spirit of the event! We watched for the elementary school to parade as well, but that didn’t happen. They’re probably waiting for the proper day for their parade, which is a much bigger affair. The Police Department blocks off the ends of Main Street, and a Fire Truck with sirens blaring and lights flashing leads the entire student body and faculty down the street. There’s one teacher who is famous for wearing vintage riding gear and riding her horse in the parade, too. Watch on Monday or Tuesday for photos from that event! The color. Hands down. This autumn we got short-changed from some of the shades by the endless bouts of rain, but we’ve still seen some nice color. And where else but a small town can you see a scene like this, right on Main Street? The brick building at the far left with the clock tower is the Wilton Town Hall, and this piece of land with the colorful trees is across the street from the entire Wilton business district. Cool, huh? At the other end of the block, this flaming red tree can currently be seen along the riverbank next to one of the municipal parking lots. The brick building behind it is one of the original working mills in town, now known as the Wilton Falls Building, and home to several businesses as well as the Wilton Main Street Association. I Said I Was Knitting at the Coffee Shop, Didn’t I? Well, here’s the proof that I not only knitted at the coffee shop last night, I’ve been working on the Market Squares Bag at home, too. In this photo, I’ve just begun knitting the final square in the 4th tier. There will ultimately be around 14 tiers in this thing. The way the bag is shaped, in a few more tiers the squares in each tier will start getting smaller. This closes in the bottom of the bag, until finally it’s small enough that you just gather the remaining stitches and you’re done. The next tier will repeat the purple that can be seen in the rim band, then we begin repeating the other colors. Thanks to everyone for being here. It helps tremendously to have you all to talk to. I need to remember more often that I’m not as alone as I may feel. Having you here isn’t as good as if I were meeting with you at the local coffee shop, but it still counts for a lot. Boring title, I know. They can’t all be gems. Truth is, I’m not feeling gem-like today. Over the last few weeks, I’ve been feeling a growing sense of day-to-day sameness. Gryphon and I get up, we figure out if there are errands to do, we do them, he goes to work, I sit and knit and watch TV until he gets home. Since it’s past midnight by then, we talk a few minutes about what to expect the next day, then go to bed. There are some breaks in the routine. We may go out on a weekend to find a Knitting Around opportunity. On Tuesday evenings, the Craft Goddesses come for craft circle night at my house. Once a month, the eats, knits, and leaves knitting group meets at the local bookstore. But the rest of the time, I’m mostly just home, knitting, watching TV, and taking a break now and then to write a blog entry. I don’t really have any friends of the “call them up and hang out a while” sort. All my friends have family activities – kids’ sports, play rehearsals, driving other family members around, and more – nearly every night of the week. Which is a good thing. I can think of things to do by myself – hang out at a coffee shop, go to a movie, take a class somewhere. But those things cost money, and Gryphon and I just don’t have any to spare. We may have to shut off the porch light and hide this coming Monday, because I don’t think we can afford to buy Halloween candy to hand out for trick-or-treat. Being right in downtown Wilton like we are – and mere blocks from the elementary school – we usually get a hundred or so kids on Halloween night. This year, we’ll just have to pretend we’re not home. I hate that. I feel trapped in the house. I feel depressed. I try to lose myself in my knitting and TV, and it works for a while. But every now and then you can’t help but remember what your situation is. Now that I’ve managed to depress you as much as I’m depressed, if you haven’t gone and unsubscribed from the blog, I’m actually ready to fill you in on my knitting. I’m still enjoying work on the entre-lac bag. It’s knitted in “tiers”, as they call them. Tier One was the blue triangles, Tier Two the yellow squares. I’m currently about two-thirds of the way through Tier Three, which are green squares. The next Tier will be in a bright pink color not unlike the hassock I’ve photographed the bag on here. I don’t remember how many tiers there are, but I think we cycle through the five colors at least twice. I’m getting better at picking up the stitches, as you can see below. The only places where the previous tier colors come through a tiny bit are where you knit a stitch from the current square with one from the tier below to join them. That shows most in this picture on the bottom right edges of the yellow squares – you can just see some blue peeking through. I like the diagonal basketweave effect of the entre-lac knitting. I can definitely see myself using this technique again, and even knitting more of this same bag in different colors of yarn. 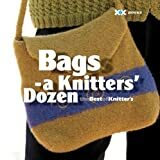 The book the pattern came from, Bags: A Knitter’s Dozen shows some examples that use a single colorway of variegated yarn for all squares. You get a subtle look that way. It might also be fun to do two or three consecutive tiers in the same color, to get wider zig-zag bands (and less of a harlequin look). I think I’m going to try really, really hard to pull myself out of this rut at least a little bit. A couple of weeks ago, I met a friend at Santos-Dumont (a local coffee shop) for the first time, and we hung out knitting for a while. I’ve been trying to decide ever since if I have it in me to go do that alone – just get a nice big mug of tea, and hang out knitting and people-watching. It’s stepping way outside of the box for me, outside of my comfort zone. But that comfort zone has become so small these days as to feel constricting. I have to do something. If anyone within the sound of this voice is in the Milford, NH area after about 7 p.m. tonight, and wants to drop in at Santos-Dumont and hang out with me….feel free to come by. Not mine, but Craft Goddess Bea’s. (We saw the partially-done piece last time.) Click anywhere on the image to see more detail. Bea has done well by her theme, evoking images of ocean life as well as gaming at Atlantic City. Fish and sea shells, hearts for romance, gold coins for the slot machines, and dice and roulette wheels. You can almost smell the ocean! We do things to enable each other, like pool orders for beads so we can get them cheap! These seed beads are actually very late backorders from an order we placed at Fire Mountain Gems all the way back in May. These seven colors hadn’t been in stock at the time. We’ve been impressed with the colors and quality of the Czech seed beads that Fire Mountain Gems started carrying just this past year. The color selection is growing all the time, and looks like it could rival Japanese beads. And the bead quality – the sizes don’t vary too widely, and the shapes are good, while not having the machine-precise cloned look that other types can sometimes have. I like Czech beads for bead crochet, and for projects like bead knitted bags, bead embroidery, and, yes, for needle-and-thread techniques like right-angle weave and netting. Friends are also great for helping with craft supplies that have to be gathered – like beer caps for bottle cap charm bracelets. One of the themes I want to do next is “Wine Taste, Beer Budget”, and I will want every bottle cap in that to be a different brand of beer. CG Judith very kindly dipped into her supply of caps and brought me this selection. Many of them are varieties I’d probably never see. Gryphon and I don’t go out to bars or restaurants that serve beer much, so we don’t have the option of asking the waiter to bring us some. And several of these beers are brands that I know Gryphon isn’t likely to buy for home drinking. Thanks so much, Judith, for bringing me these caps! Since our household beer consumption is low (only Gryphon, and not a huge variety of brands), I knew I’d be waiting around forever if I wanted enough caps for another bracelet anytime soon (notwithstanding helping hands from friends like Judith above!). So on Saturday, Gryphon and I hied ourselves over to the best homebrew supply shop in southern NH, Jasper’s Homebrew. We knew about Jasper’s because Gryphon has done some homebrewing of his own in the past. You can read more about Jasper’s in my post about the visit at I Knit Around. What’s most important to know about it for this blog’s purposes, though, is that you can buy brand-new, untouched, clean bottle caps at a homebrew supply. For fairly little money. A bag of about 144 costs only $2.99 – and you don’t have to wait to accumulate enough caps to work with. Jasper’s offers the basic gold-tone blank bottle caps, but they also do something that not all suppliers do. They have, for the same price, bags of “odd lot” bottle caps. There’s not much control over what the selection of these will be at any given time, but sometimes you can get some interesting colors to work with, like these green caps for “Windhocke Lager”. If you’re really lucky, there will be caps from popular sodas (we remember seeing “Orange Crush” soda caps a few years ago). And if you’re really, really lucky, there will be bottle caps from some unusual micro-brewery’s beer. Somewhere in Gryphon’s brewing supplies, he has a couple of bags of caps for a beer called “Bad Frog”, and the cap even has a logo with a frog in it. How’s that for a theme-starter? We Craft Goddesses have seen a catalog for a well-known publisher of craft instruction books and craft supplies, and lo! new in their product line are books about making jewelry and other crafts with bottle caps. They’re also offering packages of specially-produced 1″ round stickers for use in the caps. Additionally, apparently they’re making available clean new bottle caps in various colors – for about $30 for a bag of 200! (Remember – I paid only $2.99 for a bag of 144 at a homebrew supply!) We can’t quite decide if there’s something special about this company’s bottle caps, though – the images on the pages were showing the caps being pressed in a scrapbooking home die-cut press, and they showed the holes being punched with an ordinary hand-held hole punch. Our theory is that they’re having bottle caps for crafting specially made from a lighter-weight metal than those used in the beverage industry. . I haven’t acquired a one-inch paper punch yet – haven’t been able to spare the $8 it will cost (unless I find a coupon for A.C. Moore soon!). But I do have a good circle template, and it’s not like you have to be dead-on precise with the scissors. I have been having fun looking for images to work with. My past issues of TV Guide and other magazines, and some old catalogs, are being disassembled, and I’m pouring over them with the circle template and an extra-fine point Sharpie, picking out things that I think will be fun. I’m circling letters in ads (in case I want to spell out something). Tiny little faces in the tv listings. Logos for TV Guide and other products in the advertisements. TV Guide is a wealth of tiny images of celebrities and tv/film characters. You could easily pick a favorite actor and do a set of charms with them as a theme, and you’ll have plenty of recognizable images that fit the 1″ circle. Face too big to fit? Try just a few features. Sara Jessica Parker is a lovely girl, and that still comes through if you only see her eyes. A Popcorn Factory Catalog yields images suitable for holiday decorations – hmm….bottle cap charms as Christmas Ornaments for a miniature tree! The possibilities are proving almost limitless. Some display and packaging catalogs are offering usable background images of abstract color – they’ll often show their tissue-paper colors as a stack of reams, and carefully placing your circle will get you a colorful set of stripes for a background. A catalog of store supplies offers “SALE!” and “FRAGILE” tags small enough that the word will fit the 1″ parameters. The search for usable images is as addictive as making the bracelets themselves. I don’t know what’s going to come of all this….but I’ll be sure to tell you once I do! Or at least, in that small patch of it in Emerson Park in Milford, NH. That’s where Gryphon and I have hidden our geocache, the Milford Memory Box. We visit the park fairly often to check on the box’s condition, and have come to love this little parcel of woods smack in the middle of downtown Milford. Today, there were signs of fall – and of our recent dampness – everywhere. As usual, I found some of the color combinations displayed by the plants and trees in the park to be awe-inspiring. This is why I carry my camera everywhere – to capture the images for future browsing when I’m trying to design a new project. Here are some of the best and most interesting colors from today – maybe someone stuck for an idea will find it in these pictures. I have been talking about the Market Squares Bag from Bags: A Knitter’s Dozen for a while now, and I finally felt my project roster was clear enough to cast on for it yesterday. I like the colors I selected for the bag – a mix of brights that a lot of people wouldn’t have put together, but that make me smile to look at them. Yarn: Galway, in five colors. A single skein weighs more than was called for in any one color, and my five skeins weigh more than the total needed for the bag. But I may have color issues to decide later, as the color used for the strap needs more yarn than is in a single Galway skein. I may wind up doing the strap in color bands, which would actually be fine with me – more color, more fun! Gauge: Unknown, but then, it’s a bag, not a fitted garment. This is my first experience knitting the entre-lac technique. The first thing I’ll say to anyone considering it – if you don’t like picking up stitches, don’t even go here. Every single square you knit begins with picking up stitches. If you are trying to get used to picking up stitches, though, whether you just want to improve your technique or you’re trying to get past a personal dislike for it, entre-lac would make for a good practice program. You’re doing a lot of picking up stitches, but only in small sections at a time, and you get a rest of almost normal straight knitting in between. My first error came after I finished the tubular band for the top edge of the bag (the purple in the picture below). I thought I had carefully counted and cast-on 144 stitches as called for, but when it came time to create the foundation triangles (blue), I wound up two stitches short. I wasn’t about to re-knit the entire piece to that point, so I simply added a couple of Make 1’s, each in a separate triangle to spread out the correction. I think this fix is essentially invisible, even before felting. My second error was in the picking up of the stitches, which happened for the first time on the yellow squares. For my first two (seen in the middle and at the left below), my pick-ups were done from the edge of the triangle, and you can clearly see where the yellow comes through in a place it shouldn’t. By the third square, at the right in the picture, I had figured out to catch the bars at the back of the edge stitches. This kept the yellow from peeking through. Could I have gone back and fixed the first two squares? Yes, definitely. But this piece is ultimately going to be felted, so the appearance of the error will be either completely obscured, or at least greatly minimized, in the final piece. So far, I’m enjoying this one. The knitting is intricate enough to be interesting, yet the process of creating each new square is simple enough to memorize. This will be good take-along knitting. Won’t have to have the book sitting in front of me all the time, but it will really impress casual observers. Unless they’re more experienced entre-lac knitters than I am – then they can sit there clucking their tongues and cooing encouragingly at how cute I am, thinking I can take on big girl knitting like this! Thanks to my commenters for your kind words about my Micro-Spun socks. I actually wore them inside my walking shoes yesterday, and despite my initial evaluation that they would make better slippers, they worked fine. They still seem loose in the leg, but we’re going to see how they are after their first washing. And huge thanks to Queer Joe for linking to me after I told him about Zoundry BlogWriter in a comment at his blog. I feel as if I’ve been noticed by a celebrity! Queer Joe was one of the first knitting blogs I found when I started doing the blog thing a few months ago, and I always enjoy his commentary, his discussion of his knitting, spinning, and quilting projects, and his other life adventures (like the time that Kaffe Fassett visited his home to see a quilt Joe had made!). I may not always agree with his opinions (I usually do, though), but I love that Joe doesn’t hold them back at all. I wish more people had the guts to speak their mind that way. Thanks, Joe! Just a short post and no pictures today. After the manic frenzy in which I completed my Socktoberfest socks, I’m giving my hands a bit of a rest. I expect to cast on tomorrow, though, for the Market Squares entre-lac bag from Bags: A Knitter’s Dozen. This will be a two-fold experiment for me – I’ve never done entre-lac before, and I’ve never made a knitted piece to be felted. It’s raining heavily again here in New Hampshire, thanks to Wilma. We’re keeping an eye on the water levels. Everyone think dry thoughts, okay? Okay, not really. But I have learned that I became confused some time back when I posted pictures of a mystery tree and asked for help identifying it. An answer came quickly from a woman named leesa, and I misidentified her as a reader I was aware of, also named leesa, but better known as leesepea. Who knew I had two leesa’s among my readership? My apologies to both leesa’s for the mix-up, and my thanks to the leesa who actually identified the tree correctly as a Japanese Flowering Dogwood. We now return you to our regular program. Too late! While you all weren’t looking this weekend, I actually completed my Socktoberfest 2005 socks! Okay, to be fair, I don’t normally post on weekends, so you couldn’t have seen this happening if you’d wanted to. I still find the speed with which these came together to be amazing, though. Yarn: Lion Brand Micro-Spun, 2 skeins of Lavender (1 per sock), and scraps of Fuchsia. As I’ve reported before, this pattern is a breeze to work with. Follow the instructions as written, and you won’t have annoying holes along the picked-up stitches for the gusset, or at the heel turn (and you don’t even have to wrap stitches!). My first attempt at SE5 was done with size 2 dp needles, and while it produced a recognizable sock, I had trouble getting it to fit. After successfully knitting a pair with size 4 circulars, my conclusion is that the fabric I achieved with size 2’s was too stiff. It wasn’t elastic enough to conform well to the foot, and I wound up with some areas bagging while others were binding. Not good. You may have noticed I said “size 4 circulars”. A little before I got to the heel of the first sock with my size 4 dps, I was getting frustrated handling the needles. I forget what brand I’ve got, but their size 4’s are several inches longer than their size 2’s, and distinctly heavier. I had several instances of a needle dropping out of the piece altogether. I knew I had one 40″ size 4 circular, so I dug it out and decided it was time to try the so-called “magic loop” method. Truthfully, there’s not much “magic” to it – it’s merely the only logical way to manage extra cable if you try to knit a circular piece with less circumference than the length of your circular needle. I’d knit with the “magic loop” method decades ago, it’s just that no one had thought to publish a book describing it. It would make as much sense to declare the Fifth DP needle to be the “Magic Needle” when you write about how much better 5 dps are than 4. In the case of knitting with a magic loop on a single sock, I didn’t like it. Manipulating the loop around the piece as I worked was quite annoying – at least as annoying as the dps had gotten to be. Something had to change. Checking the budget carefully, I decided I could squeak out just enough money to get a second size 4 circular needle, and switch to the 2-circs method. Okay, now this was a technique that I feel deserves the term “magic”! Suddenly, my sock knitting was something I could carry in the car without having to worry about losing the needles. I could try the sock on as I worked without having to move anything to scrap yarn. And my knitting went much, much faster, because I was working half a sock at a time in a straight run before having to change needles, not a quarter of a sock before having to re-adjust all 4 dp needles so they wouldn’t fall out when I moved to the next one. As to the socks themselves: I really like how the Micro-spun worked out on size 4 needles. It’s dense enough to have some body, but loose enough to be soft and to conform to the foot. The pattern from Sensational Knitted Socks was spot-on, except I think I may have extended the foot a skootch longer than I should. I had to modify the toe shaping to decrease more rapidly at the end. Knitting one less repeat of the baby cable rib pattern would have made a huge difference there. I’ve tried them on, and they fit well, but the second sock is a little looser than the first. I think I must have been more comfortable with the pattern and process, and knit more quickly, which tends to loosen up my tension. It also explains why with the first sock, I had a few yards extra lavendar yarn, and with the second sock, I came up two rows short. At least I had the leftover from the first. In total, I wound up with only about 2 yards of lavendar yarn left between the two skeins, if even that much. The fit is a soft, cushy feel – less like a sock, really, and more like a slipper. I suspect I’ll be keeping these as house socks to wear on cold days. They certainly feel warm and cozy – exactly what you want for keeping the tootsies comfy in the winter. I think if I do any more Micro-Spun socks, I’ll do so with the same intent – house socks, not walking around in shoes socks. All in all, though, I consider these a success. I learned a lot, tried both a new knitting technique and a new yarn, and wound up with a highly wearable pair of socks for myself. At least, that’s what it seems that local homebrewers think about Jasper’s Home Brew, 4 Temple St., Nashua. Jeff, the owner, has developed a fantastic rapport with his customers, and his extensive knowledge and wide stock of equipment, ingredrients, and supplies make Jasper’s Home Brew & Winemaking Supply a destination for homebrewers throughout southern New Hampshire. Gryphon and I first discovered Jasper’s when Gryphon took up brewing his own beer at a previous apartment we lived in – one with a full basement in which shelves of beer bottles and brewing equipment could be easily stored. As we relax further into life without a retail store of our own to operate, he’s considering figuring out how he can take it up again in our current, more limited living quarters. It wasn’t for Gryphon that we visited Jasper’s this past Saturday, though – it was for supplies for my beadwork! A recent project at the Craft Goddesses’ circle was making bottle-cap charm bracelets. I enjoyed it enough that I wanted a supply of new bottle caps to work with. So, off to Jasper’s we trotted. Of course, while we were there I had to look for a Knitting Around opportunity. We asked Jeff what he thought might be the most interesting thing he had, and he pointed out these brand new oak barrels for aging wine that stood next to the counter. If you don’t want to make your libations for yourself, Jasper’s also offers a selection of ready-made wines and beers, many from micro-breweries or small vinyards. And for the snacky accompaniments to your beverages, he’s got an interesting line of unusual hot sauces as well. After we finished at Jasper’s, I realized we were just around the corner from a yarn shop I’ve never visited before: Ewe’ll Love It, 100 Main St., Suite 4, Nashua. I had heard from some knitting friends that it was hard to find the shop, and even with that warning, it was true. The main entrance on the front of the building appears to open directly into a gift shop at the street-front, with no clue as to the presence of the yarn shop except for the sign hanging on the corner of the building. Be Bold, however, and enter that door anyway. It turns out that the inside is almost like a mini-mall – something that the property owners haven’t made clear, as the exterior of the building shows no listing of the shops and businesses inside. Walk down the hallway past the gift shop, and to the back of the building, and there you’ll find Ewe’ll Love It. I had no money for yarn purchases that day, so I had to just look, but look I did. The place is large and well-stocked. I was amazed at the sheer variety of fibers and types of yarns on display. There are large selections of books and patterns as well. My only quibble was that the lighting was, to my taste, a little dim in some of the corners of the space. It might have helped if the day had been sunny, as there is a 2-story lofted section of the shop with large windows in the upper level. But on the Saturday we visited, it was a gray, rainy day. The shortcomings in the lighting are obviously a result of how the property owner equipped the space, however, and the owners of the yarn shop are doing their best to provide additional lighting in the form of floor lamps in various locations. Having experience as a retail shop owner myself, I’m aware of how difficult it can be to overcome how your landlord chooses to handle the property. The overall effect is that you’ve walked into a fiber artist’s combination living room and studio. There are cozy arm chairs tucked in some corners, decorative floor lamps help to light reading/knitting nooks, and there are walls and shelves of colorful yarn everywhere. The bookshelf full of pattern sheets in binders is conveniently located next to a reading table with chairs. The shop is very welcoming, and I can imagine that those who have found Ewe’ll Love It and have shopped there, well….that they do love it. I had heard rumors from some knitting acquaintances that they felt Ewe’ll Love It was expensive, but I have to say that I didn’t find that to be the case. The yarns I saw were priced comparably to what I’ve seen at other shops, and frankly, they had greater variety in colors, brands, and styles of yarn than most of the shops I’ve seen in the area. I couldn’t shop that day, or I’ve have come home with a bagful of yarn, I’m sure. I can say for certain that I’ll be going back to Ewe’ll Love It, though.